NEW! Easily combine two of your greatest loves... woodworking & cooking! Three classic shapes all function as usable cutting boards or even kitchen wall-art pieces. Made with 1/2 hardwood of your choice. Choose a couple of different species to give that color contrast look. A revolutionary breakthrough!! 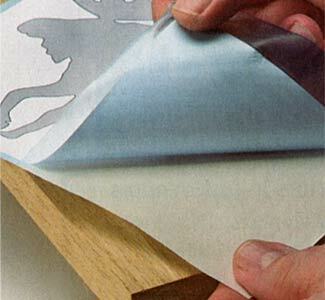 This AMAZING two-sided adhesive product works double duty -- not only does it beautifully adhere paper patterns to wood, but it also aids in keeping your scroll saw blade lubricated to cut down on unwelcome scorching while scrolling (no more having to sandwich your pattern in between strips & strips of blue painter's and clear packaging tape, saving you time & money!) Scroll Saw Tape is a snap to use and comes in rolls that are 8-1/2" wide, in your choice of 5' or 20' lengths. It's easily repositionable yet sticks firmly to wood while scrolling. Clean-up is a breeze -- tape peels off effortlessly, leaves no annoying residue AND can be reused as project sizes permit. We think you're going to like this new "Stick 'n Release" Scroll Saw Tape as much as we do and as always, we welcome your feedback! © Copyright 2018 Scroller, All Rights Reserved.